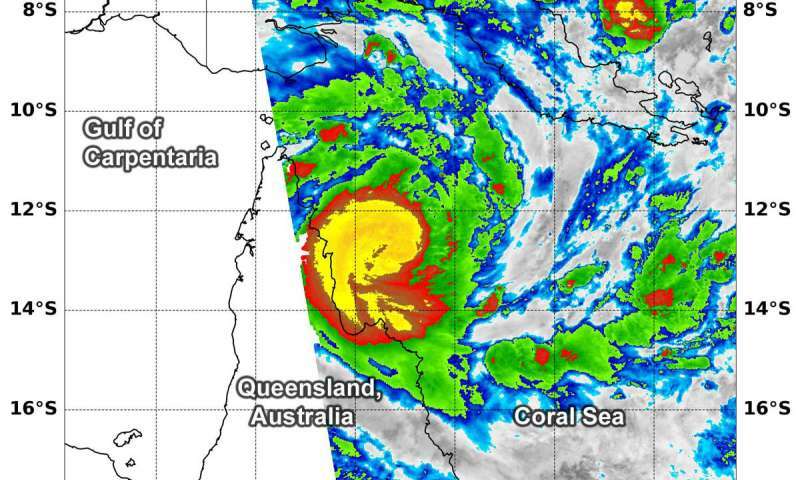 Tropical Cyclone Trevor formed in the Coral Sea of the Southwestern Pacific Ocean on March 18. NASA's Terra satellite analyzed cloud top temperatures in the storm which gave an indication of the storm's strength. Trevor has already triggered warnings in Queensland, Australia. he Australian Bureau of Meteorology posted warnings on March 18. A tropical cyclone warming is in force from Orford Ness to Cooktown, and a tropical cyclone watch is in force from Cape York to Pormpuraaw. For local information, visit the Australian Bureau of Meteorology website: http://www.bom.gov.au/cgi-bin/wrap_fwo.pl?IDQ20023.html. At 8:25 a.m. EDT (1225 UTC) on Mar. 18, the MODIS or Moderate Resolution Imaging Spectroradiometer instrument aboard NASA's Terra satellite looked at Tropical Cyclone Trevor in infrared light as it moved to the Cape York Peninsula of Queensland. MODIS found coldest cloud tops had temperatures near minus 80 degrees Fahrenheit (minus 62.2 degrees Celsius) around the center of the tropical storm. Storms with temperatures that cold are indicative of strong storms and have been shown to have the capability to generate heavy rainfall. The Joint Typhoon Warning Center or JTWC posted at 5 a.m. EDT (0900 UTC) on March 18 that Trevor was located at 12.3 degrees south latitude and 145.0 degrees east longitude. That's approximately 280 nautical miles north of Cairns, Australia. Trevor was moving west. Maximum sustained winds were near 50 knots (57 mph/84 kph) and strengthening. Trevor is currently a tropical storm and is expected to reach hurricane-force. JTWC expects that Trevor will strengthen to 70 knots (80.5 /129 kph), before making landfall in the Cape York Peninsula on Tuesday, March 19. After crossing the peninsula, the storm will emerge into the Gulf of Carpentaria, where it is expected to re-intensify. The forecast track takes Trevor to a second landfall near the Queensland / Northern Territories border on Friday, March 22.